It’s been a fast two years since we last ran a motorcycle chain lube review (see our 2008 motorcycle chain lube review). These quick takes on chain lubes would more accurately be called overviews, because it’s virtually impossible to conduct any kind of truly objective rating or review of a motorcycle chain lube. To truly understand the effect a chain lube might have on chain life would involve setting up a laboratory trial. This would need something like a motorized shaft holding a dozen or so sprockets and identical chains. The system would rotate at various speeds, driven by an electric motor. A series of stresses would be placed on the system, with bumps and torque changes, starts and stops and heating and cooling cycles so that each chain would experience identical stress. One chain and sprocket assembly would be left dry, while the others would be lubed per the chain lube manufacturer’s instructions. The system would then be set in motion and run this continuously for a few weeks to see what happens. But that’s the easy part — an industrial lab capability would be required to analyze each chain, sprocket, link and O-ring to see which chain lube worked best. Unfortunately, that’s way beyond our capabilities, and apparently many others; we don’t recall ever reading about this type of test being conducted. So, that leaves us with our totally subjective motorcycle chain lube user reviews. This means that the lubes are evaluated based on criteria like ease of application; how much or how little sticky residue is left; and using the old eyeball opinion on how long the lube seems to last. Again, this is completely subjective and based on our experience, as are all webBikeWorld reviews, so your experience and opinions may differ. There is no logical rhyme or reason why this particular group of chain lubes was selected; they just happened to be available, they looked interesting and we hadn’t tried them yet. The benchmark for motorcycle chain lubes is the tried-and-trusted DuPont Teflon Multi-Use spray. It’s cheap, it’s available just about everywhere and it works. It’s also the favorite of many webBikeWorld readers and has been for years. Spray it on and the liquid carrier magically evaporates, leaving behind a dry Teflon-laced lubricating residue. The product is easy to use and it doesn’t leave any sticky residue that would only serve to attract more dirt. The rest of the lubes described in this report are compared to the benchmark DuPont product, which is still #1 in our opinion. The Original Bike Spirits was our favorite in this group, but the DuPont product still has them all beat. By the way, besides choosing which chain lube type and brand to use, the jury is still out on how much lube to use and when to lube. Some riders are fanatical about keeping their chain clean and properly lubed, while others have a “Oh, that’s right — I’m supposed to lube the chain” attitude and the chain gets a spritz every now and then when the owner remembers. Some claim huge mileage with either method, so who knows. Me? I think modern O-X-Z-ring chains don’t require all that much lube to provide good service. I clean mine every once and a while with some WD-40 or similar sprayed on a couple of paper towels. I use the DuPont Teflon lube and it works because it dries, keeping the chain pretty clean. * Winner of the 2010 wBW Spray-Off. **Included for comparison purposes only. * Winner of the 2010 wBW Spray-Off **Included for comparison purposes only. Price: It costs what you’re willing to pay. Efficiency: Just the right amount can be placed on the chain with a minimum of overspray and dripping. Sprayer: The spray volume and shape is powerful enough to do the job without over-spraying and the sprayer allows precise control over delivery. Effectiveness: That it works (or at least seems to, because again — who really knows?). Ease of Use: Easy to apply (whatever the word “easy” means to you — because if it ain’t easy to apply, you’re not going to do it, and the “best” chain lube in the world is worthless if it sits on the shelf). Resistance to Fling-Off: It stays on the chain and doesn’t spray all over the wheel, swingarm and everywhere else. The Sticky Factor: Sticky or greasy lube attracts dirt, dust, pollen and chewing gum wrappers. Not good and not necessary with modern carriers and lube ingredients. Longevity: The product seems to last, at least until the next time you get up enough energy to bend down and do the job again. Same notes as published by the Editor in 2008 go here. 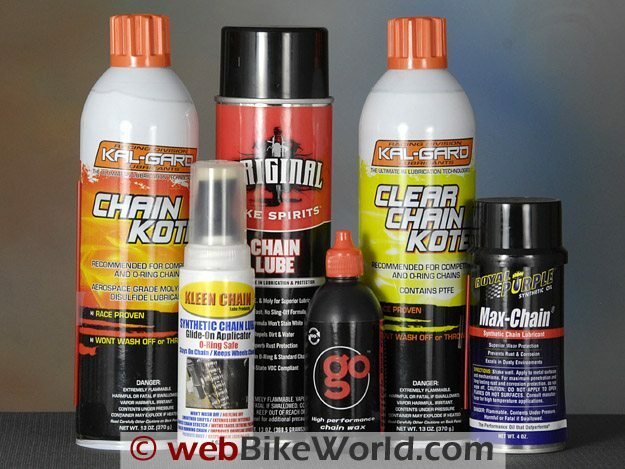 Every time we publish a chain lube article, we get emails from readers who either never lube their chain (they allow the grease behind the O-rings do its thing) or fanatics who have the controls for their oiler right up there on the handlebar, so they can give a squirt every few miles or so. I definitely tend towards the former rather than the latter. If I remember, or if the chain starts to look kind of dry, dusty or dirty, I may throw the bike up on the center stand or swingarm stand and wipe the chain with whatever’s at hand — WD-40, kerosene, chain cleaner, Simple Green or whatever) and spritz some oil or lube on it. Lube freaks will be, well, freaking at this, and I know you’re supposed to lube the chain while its still warm after a ride (the last thing I feel like doing by time I get home) and that the lube should be sprayed on the top side of the bottom run of the chain, just before the chain goes into the rear sprocket. I like to use a lube with a liquid form where the carrier evaporates. Some of the foamy sprays are nice also, as the foam bubbles the lube down into the chain bits. I’m not fond of the thick lubes or waxes. My feeling is that the best lubes are the ones with a focused spray that allows precise applications on to both sides of the chain’s side plates, with a minimum amount of overspray or mess or drips. I will admit that it is probably better for the chain to be warm when lubing from the top, because the warm chain probably helps to distribute the spray more effectively down there in between the side plates — but again, who knows for sure? Try to make sure the spray gets on the side plates — that’s really what you’re lubing, because the O-rings are theoretically keeping the insides of the rollers filled with grease, and any lube on the outside of the rollers is gone the first time they pass through the sprockets. As always, we’re open for suggestions, advice and tips; see the “Owner Comments” section below. Publication Date: May 2010. Updated August 2011. From “G.S.” (August 2011): ” Waaaay back when, I was having chains on a 250 Ducati breaking with regularity, and the Service manager at this really old dealership in Houston suggested a trick. He said I needed to take a can of STP, add it to 1 quart of motor oil, catch my mother gone so I could use one of here cook pots and put it on the stove with the chain laid flat in the bottom and heat it up. Then remove it and hang it over some newspaper in the garage until it quit dripping and reinstall and adjust it. I did that to the 3rd new chain I bought and never replaced it after that. Don’t know if STP is compatible with the O-rings now or not, and motorcycle chains have come a long way since those days of wooden sprockets, but it may be worth a try. Editor’s Reply: Thanks for sending the old-timer’s tip! Chains have come a LONG way since the Ducati 250 days — I know; I had its competitor, a Bultaco Metralla! O-ring chains didn’t exist back then as far as I know, but just about any old oil seemed to work fine as a lube. The first time I bought a lubricant specifically designed for motorcycle chains was during my RD400 days in the late 1970’s. Modern chains really need very little lube or maintenance (other than staying on top of the adjustments). To be honest, I think most people fuss with lubes too much, more as a pacifier than anything else. I rarely lube, maybe a couple of times a year if I remember it or if the chain starts to get gunked up in the winter. The modern chains work just fine — but you have to replace them with the sprockets on a regular basis anyway (one of the downsides of living with a chain-driven bike). My feeling is that no one really knows whether he or she got a couple thousand miles extra on the chain because they used the latest and greatest lube. Or, because people who lube more frequently are probably more fussy about keeping the chain in correct adjustment — which does more than anything for chain longevity.